My Grandfather had a Remington No. 6 'Boy's rifle' chambered in .22lr when I was just a boy. I remember handling it, but I never fired it as we lived within city limits and I was too young to be trusted with it by myself. I've no idea what ever became of that rifle. But I've never forgotten it. I've looked into buying one, but I am astonished at the prices those simple rifles bring on the online auction sites. So, I've thought about making one, but without an example 'in hand', I don't remember nearly enough to even get started. Is anyone aware of any dimension drawings or even some detailed photographs available somewhere? Here, try this as a start. You're a peach. Thanks a million! 10 and loved to shoot. I too thank you for the link. Ive been wanting to build my own rifle for some time. Once I get retired I may get around to it. This looks like an excellent first attempt. The No.6 is a nice design for the home builder since it uses a laminated receiver construction. It uses a frame sandwiched between two 1/8” sides. I was going to build one too but came across a beat up example that I was able to restor to working condition. If you’re interested I have a frame, hammer, breach block and assorted other parts that I’d sell at a very reasonable price. And here is a schematic to show how simple they are. Last edited by tbx-4; 08-25-2018 at 02:15 PM. I have a question. Where can you get a 22 barrel with the slower twist rate for 22short? I know you can use a 22lr barrel but ,it will not shoot as good. Most today will not even consider this.Almost all 22 short only rifles are gone. Even the ammo is often in short supply. Too bad because I like the short. Would these actions be suitable for 32 H&R? Beefed up a little of course? Thanks for the plans. I was going to just throw something together for a 22WMR to test cartridge development but now I can make this very nice rifle. If anyone else is interested, I got a couple of really inexpensive barrels on eBay for 22 lr. It seems that the Marlin Model 60 barrels are plentiful. I got lucky and got two of them one of which looked like it had never even been attached to a gun (older longer barrels). I ended up paying $32 for both barrels. That's $16 per barrel. The best I have seen other than that was about $22 per barrel. Having a barrel to start with should save a lot of work. I have been working on building a Remington #6 copy in 32 H&R magnum for over a year now. Progress is slow, but the project is coming along. It requires more than a "little" beefing up. Instead of 1/8" case hardened mild steel side plates I'm using 3/16" thick pre-hardened 4130. The frame and internal parts are widened to 1/2" thick. The hammer, breech block & all the pivot pins are hardened 4140. The pivot pins have been greatly enlarged as well, and all screws are grade 8. It uses coil springs instead of flat springs, and the receiver is about 30% larger than an actual Remington #6. This action is significantly beefed up! Even with this, I won't know if the action will be able to take this cartridge until after its test fired several times. I believe that this rifle will work OK (time will tell). There are some things that I would change now that I know better. Instead of using a .312 barrel blank with a 1 in 10 twist, I'd opt for a Marlin '92 barrel in 32 caliber because it has a 1 in 16 twist. 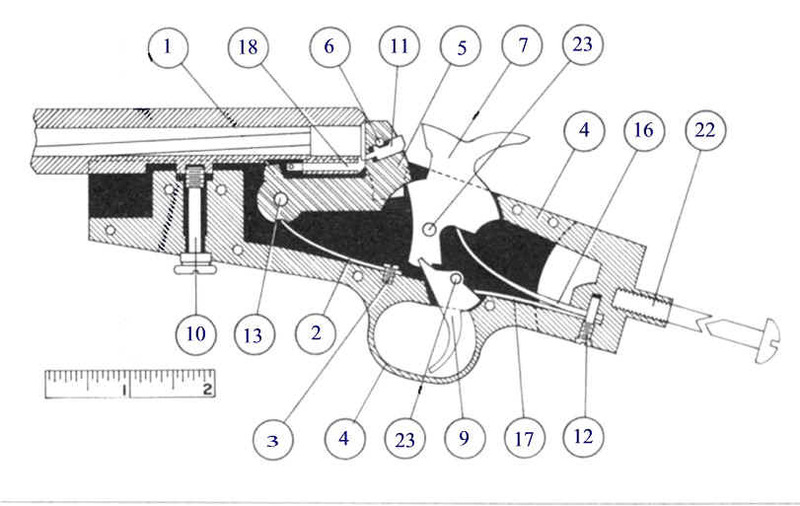 Also, I chose to build the action as the #6 improved, which has a single spring between the breech block and hammer. With the larger (heavier) hammer and breech block, a single spring would be either too strong for holding the breech block open & closed, or too weak for the hammer. This action in 32 H&R requires separate breech block and hammer springs. My advise to anyone that wants to build a #6 is to make one in 22 long rifle. It's an excellent platform in that caliber, and a good action to learn on. A better action to build a 32 H&R magnum on would be a Chicopee centerfire. After I finish the #6, I will very likely build a Chicopee in this caliber. One final note: there are two types of chambering reamers for this, (and other pistol) calibers. The standard type of reamer is a cylinder reamer, used for chambering revolvers. A different type is used for rifle barrels. Don't use a cylinder reamer to try to chamber a rifle barrel or it will have the wrong type of throat, and will shoot terrible. Try Redman for a barrel in short twist they have liners in the right twist. Or just use a junk barrel and reline it, a good reline will shoot as good or better than the original barrel. I put a Rem 12 barrel on a Crack Shot and it shot shorts well. Was a older octagon barrel. Track of the Wolf sells bbl liners for 22short. Liners are getting crazy expensive of late though. I believe TOTW liners are those made by TJ Enterprises. Probably a bit less expensive right from the mfg'r. Mike Sayers at TJ's Liners used to be the contact,,don't know if he's still there.. But the # and address should still be correct. They never had a website AFAIK.